For a great day out, go on a voyage of discovery through Leiden. Leiden is certainly worth visiting. The other name people use for Leiden is Key City, because of the Leiden coat of arms, two red crossed keys, that are omnipresent in the city, like a leitmotif. The rich history, museums, the many restaurants and cafés, various cultural events and good choice of shops make Leiden an attractive and lively city. Leiden is also renowned as a student city. For something a bit different, take the boat and view Leiden from the water. There are a number of boarding points for a unique boat trip, taking you past extraordinary places from the history of Leiden. Of course you can also hire a boat or a pedal boat to discover the pearls of the city yourself. Leiden has a strategic location in the Randstad urban conglomeration of Amsterdam, Rotterdam, The Hague and all the areas in between. After Amsterdam Airport Schiphol, Leiden actually has the best transport links in this conglomeration. Leiden is easiest to reach by train, because it has three railway stations. If you wish to go by car to Leiden, there is plenty of parking available – Leiden has six multi-storey car parks and seven other car parks! Leiden is a treasure trove with beautiful monumental buildings such as the Burcht medieval fortification, the churches of Sint Pieterskerk and the Hooglandse kerk and the Leiden Town Hall. Leiden has 35 inner courtyards, and 88 bridges spanning the canals. 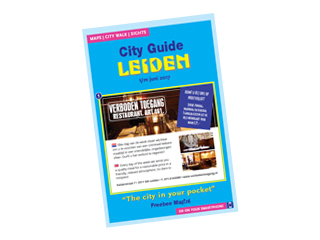 If you wish to see the best places in Leiden, you can do the city walk from the Freebee Map in the brochure that you can order from this website by means of an SMS service. Then you can be certain that you have seen all there is to see in Leiden. Leiden has much to offer in the area of art and culture. No city has been home to so many famous painters as Leiden – for example, Rembrandt van Rijn, fine painter Gerrit Dou, the jovial innkeeper Jan Steen, Jan van Goyen, Lucas van Leyden, as well as Theo van Doesburg, founder of De Stijl Dutch artistic movement in Leiden. Leiden has a lively music scene. Both well-known artists and many local bands regularly perform at the LVC centre of pop culture and the Q-Bus concert venue. There are also regular performances by well-known artists at the Stadsgehoorzaal Leiden municipal concert hall. Leiden has fantastic museums. Dinosaur skeletons, masterpieces by Rembrandt and Lievens, Wajang dolls from Indonesia, the history of medicine from bloodletting to breast prostheses, an Egyptian temple or a voyage of discovery through the human body: the museums in Leiden have all this to offer. The Dutch National Museum of Antiquities (Rijksmuseum van Oudheden), where you can learn about the cultures of ancient Egypt, Greece, Rome, the Near East and the early Netherlands. Leiden is a really charming city to shop in. Leiden has several atmospheric shopping streets, such as the Haarlemmerstraat, the Breestraat, Lange Mare and the Nieuwe Rijn, where you will find all the large shop chains. Leiden also has many small shops and speciality shops. The beautiful city centre and the good transport network make it a very attractive option to spend a great day out shopping in Leiden. On Wednesdays and Saturdays, you can visit the market, which is located between the Haarlemmerstraat and Breestraat. Leiden has hundreds of restaurants, cafés and pubs where you can enjoy culinary delights. Since Leiden is a student city, you will also find numerous cafés where you can eat well on a low budget. Many restaurants and cafés are housed in beautiful monuments, so that eating out in Leiden is often a very special experience. There are many pubs in Leiden. There are not many real discotheques. The pub Barrera is a very popular place to go in Leiden, with its terrace overlooking the canal and a view of the century-old Academy building. The restaurant Annie’s Verjaardag with its terrace overlooking the water is also a good place to sit and watch the world go by. Café de Bijlen is located right between the University library and the railway station, next to an old city gate. The Liberation of Leiden (Leids Ontzet), held on 3rd October, with an enormous town festival to celebrate. The events calendar in the Freebee Map gives an overview of events taking place in Leiden.